OKLAHOMA -- It's a shocking case of animal cruelty and a second suspect has been arrested. Last October, a dog was tied to the bumper of an SUV and dragged for nearly a mile in Creek County. After several months of investigating the woman accused of tying the dog to the bumper is charged with animal cruelty. 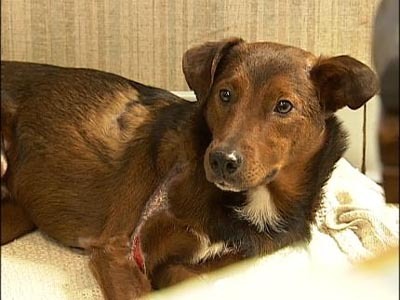 The dog, Sammy, not only survived the violence, he is thriving with his new family. He's happy and healthy with his new family. That wasn't the case last year after Sammy was dragged behind an SUV. "He looked like he was all covered in cuts and cuts and he was oozing and everything," said Isaac, Sammy's new owner. Witnesses identified 20-year-old Cody Wayne Hahn as the driver of the SUV. He was arrested and charged with felony animal cruelty. But, as Sammy was healing, another suspect avoided arrest. She was the woman investigators say tied Sammy to the bumper. Deputies arrested 18-year-old Rikki Leigh Seritt after proving her original alibi was a lie. She's now charged with felony animal cruelty plus two counts of obstructing an officer. 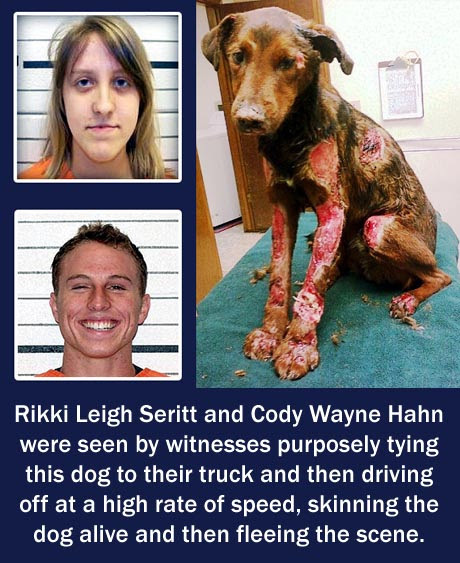 According to an affidavit, Seritt told a friend she was there when the dog was tied to the bumper and dragged by Cody Hahn. TEXAS -- A San Angelo woman was sentenced to a year in jail and ordered to pay $18,625 in restitution after she was found guilty of cruelty to animals. Brenda Luellen, also known as Brenda Kenney, waived her right to a jury and an attorney and represented herself during Friday’s trial. Assistant Tom Green County attorneys Jill Simpson and Gerald Fohn prosecuted the case, which alleged Luellen cruelly treated 69 dogs and puppies that were taken from her home April 4, 2008. The case took more than a year to come to trial, and in the intervening time Luellen was again cited. On May 26 of this year, city officials removed 59 dogs, most of them shih tzus, from the Bluffs home, this time on a health violation after neighbors complained about dog feces washing onto their properties after rains. “I don’t know how to stop you, but dogs you take into your care and custody do not deserve this,” County Court-at-Law No. 2 Judge Penny Roberts said shortly before handing down her sentence. 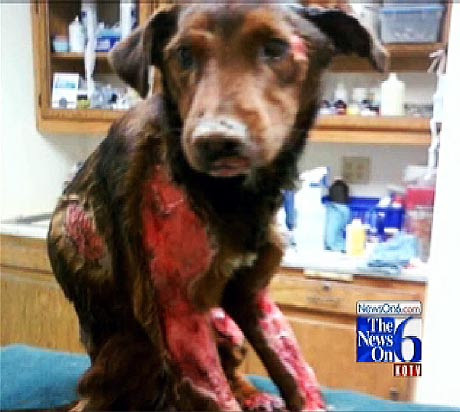 Cruelty to animals is a Class A misdemeanor and punishable by up to one year in jail and a maximum $4,000 fine. The pending health violation charges carry up to $2,000 in fines. City officials estimated it cost $8,625 to care for the animals. Costs included transport, veterinarian bills, vaccinations, external parasite treatment, feeding and shelter. The nonprofit organization that rehabilitated the dogs estimated its total cost at $10,000, which was spent on getting the animals from the shelter, surgeries, medications and rehabilitation. Prosecution witness Leslie Turney, city animal services manager, testified to the cruel treatment of the 69 dogs and puppies taken from the home in the 6000 block of Kingsbridge Drive. Simpson’s second witness was Jenie Wilson, a volunteer with Shih Tzus & Furbabies Rescue, a Georgia-based organization that rehabilitates dogs and places them for adoption. The third witness, Arthur Kenney, was called by Luellen. 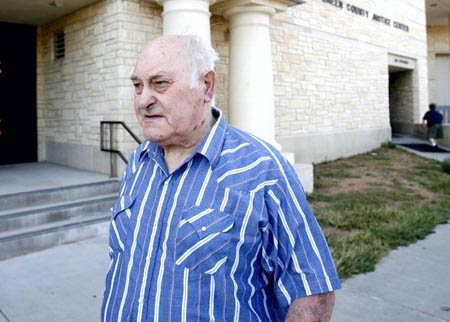 He testified he was living in the home at the time the dogs were removed and that Luellen’s two sons were in charge of “feeding and taking care of them.” He said Luellen and the young men would bathe and groom the animals. Wilson said many of the animals had eye infections and fur matted with urine and feces. In some cases, the dog’s fur was so matted it was “like a solid coat” that had to be shaved off. One male dog was so matted, he could not move his back legs. “I’ve never seen dogs in the condition these were in,” Wilson said. Prosecutors showed the court photos and a video of the animals shortly after they were taken. “We think certainly the facts of this case justified the punishment, the maximum punishment, the judge gave,” Fohn said. During the recess Luellen said she knew her house was dirty the day city officials took her dogs, but since she had forgotten to pay the utility bill, there was no hot water. She said she was in the process of turning it on when the dogs were taken. 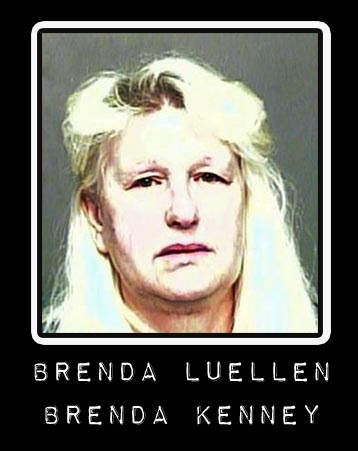 Luellen has 30 days to appeal the court’s decision. Her husband’s trial for the same charge of animal cruelty is scheduled for next month. CALIFORNIA -- A Riverside County man suspected of decapitating his horse with a chain saw has been found mentally competent to stand trial. 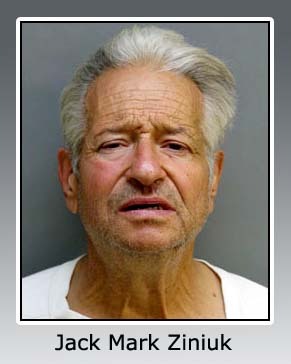 Sixty-four-year-old Jack Mark Ziniuk was charged with felony animal cruelty in April. Officials said he hit the horse over the head with a sledgehammer - which couldn't have killed it immediately, decapitated it with a chainshaw, then fed the head to his dogs on his property in the remote mountainous community of Anza. A judge on Friday said psychiatric analysis showed Ziniuk, who has pleaded not guilty, was mentally fit to stand trial. Ziniuk had called authorities to his property, telling them his horse was having seizures after being attacked by dogs and needed to be put down. 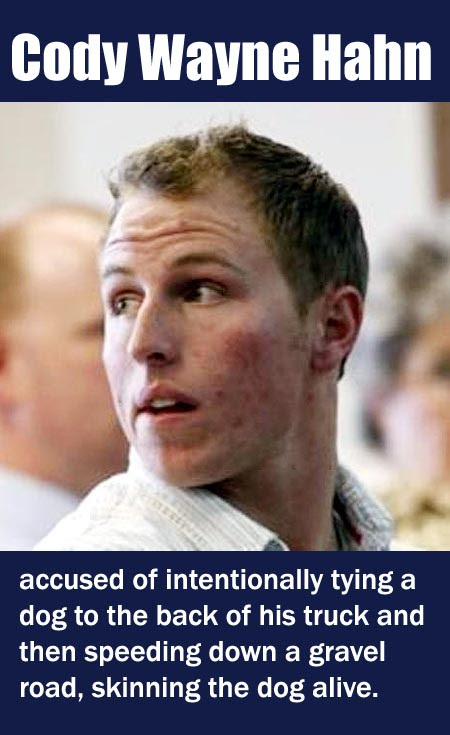 Prosecutors have said he neglected the horse before killing it. FLORIDA -- Mr. Snuggles, the dog found locked inside a hot car at the grand opening of Ikea last month, will soon have a new home. His former owner, 19-year-old Amy Chantarak, voluntarily gave up custody at a hearing Wednesday afternoon with a quiet "yes, sir," after a withering judicial tongue lashing. "What's wrong with you?" asked Hillsborough County Judge Nick Nazaretian. "What piece of furniture is worth your dog's life?" Nazaretian barred Chantarak and her boyfriend, Paul Durrance, from owning another animal again in Hillsborough County without the court's permission. And he fined Chantarak $400 — the cost of keeping Mr. Snuggles in county care for the past month. While the custody issue is settled, Chantarak still faces a criminal trial for animal cruelty. She declined to comment after Wednesdays' hearing. 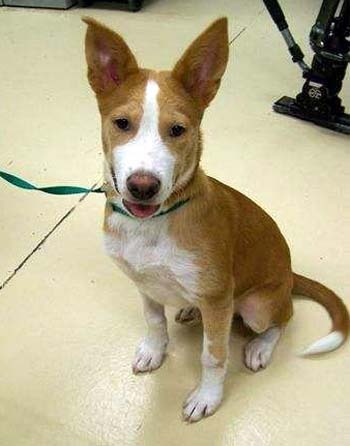 Mr. Snuggles, a 3-month-old Lab and collie mix, has been living at the Animal Services investigative unit since Chantarak was arrested May 6. 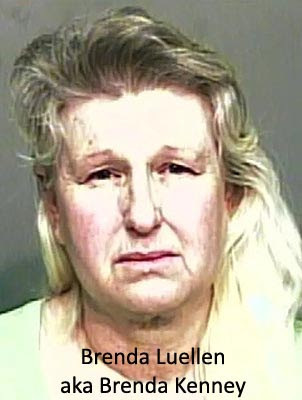 She was released from Hillsborough County jail after posting a $1,013 bail. Investigators estimated Mr. Snuggles had been in Chantarak's black Mazda for about 40 minutes in more than 100-degree heat that day. At the time of her arrest, Chantarak was wanted in Pinellas County for failing to appear in court on another animal cruelty charge from December 2007. She had been accused of leaving her chihuahua Mumu in the car overnight. Animal Services spokeswoman Marti Ryan said Chantarak has no other dogs. She told Animal Services that Mumu, the Chihuahua she was previously charged with animal cruelty for, died after being hit by a car. Ryan said many people expressed interest in adopting Mr. Snuggles after the May incident made the news, but she had to turn them away while Chantarak had custody. Though the inquiries have died down, Ryan is confident Mr. Snuggles will soon have a loving home. "It's easier while he's in the spotlight," Ryan said. "But he's so cute. He's so precocious." As for Chantarak, "Take a good look," Nazaretian said. "All that love he could have given you, but you didn't give him love. You gave him heat." Chantarak looked down. "Yes sir." Florida: Amy Chantarak, 19, charged with animal cruelty after dog left in hot car at Ikea grand opening. This is the 2nd time she's been charged with animal cruelty for locking a dog in a car! PENNSYLVANIA -- Police in Pennsylvania said a man who buried his dead cat in a neighbor's tomato garden was charged with trespassing. Patricia Lapsanky Lutz, 55, of the Slatington area, said she was preparing to plant tomatoes Thursday when she came across the carcass of Patches the cat, the Allentown (Pa.) Morning Call reported Tuesday. "All I did was turn the soil over maybe 10 inches, and there were paws sticking out," she said. Lutz called state police to have the cat exhumed and it was identified as Patches, a cat belonging to neighbor John Paly, 49. Paly admitted to police that he buried the cat in the garden May 30. "He said he didn't have anywhere else to bury it," Lutz said. Paly, who said he expects to pay a $30 or $35 trespassing fine, said he felt he had the right to use the plot to bury his cat because he had tended the garden for 16 years before Lutz moved in and another three years after she arrived. He said he does not believe the police needed to get involved. "All she had to do was come over and say, Hey, I don't want the cat buried there," he said. Patches is now at rest in a Slatedale, Pa., pet cemetery. Lutz said she does not plan to plant any tomatoes in the cat's former resting place. "I won't touch that soil now," she said. "I just can't. I don't know where I'm going to put them now." FLORIDA -- A woman injured in an attack by two pit bulls last month in Victoria Park filed a lawsuit Friday against the dogs' owners, her lawyer said. 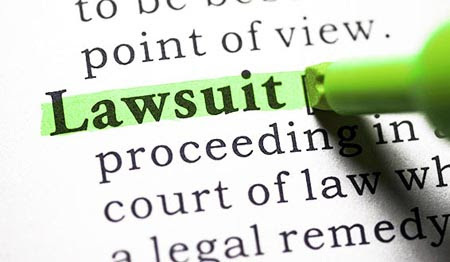 Kailen Gonzalez, 25, of Fort Lauderdale, filed the complaint in Broward Circuit Court against Katarzyna Zalewski and her husband, Marek Zalewski, both of Fort Lauderdale. Gonzalez's attorney, Sam Coffey, said her face was scarred by dog bites she suffered in a May 20 attack as she and her brother were walking three dogs. She said the Zalewski couple's dogs pounced on her, killed a dog she was dog-sitting and hurt another. Coffey said Gonzalez wants compensation for her injuries and medical bills, and "intends to allow a jury to determine the value of this claim." Katarzyna Zalewski did not return a phone call Friday seeking comment. But earlier this month, she disputed Gonzalez's claim, saying her pit bulls, Bobby and Shelbi, were provoked to attack on her property. Zalewski was cited for lacking county pet licenses and vaccination records for each dog, resulting in four citations, Mendheim said. Each citation carries a $67.50 fine, she said. Under Broward County's dangerous-dog ordinance, the pit bulls were euthanized. 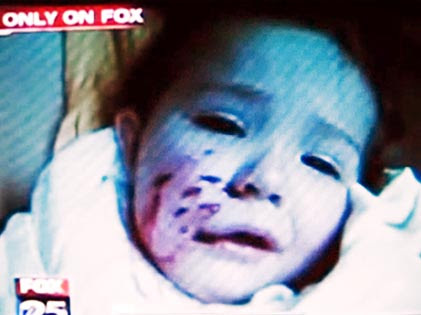 MASSACHUSETTS -- Police said the pit bull that bit 1-year-old Bianca Zangari-Dacey in the face last week has been destroyed and that no charges will be brought against its owner. The girl's aunt, Samantha Dacey, 22, of Lawrence said police told her the child's mother does not want to press charges and that "their hands are tied." "The city should be pressing charges," Dacey said yesterday. "You can't have dogs biting people. It's just not right." Yesterday, the only explanation Deputy Police Chief Donald Thompson would provide as to why charges are not being brought against the dog's owner at this time was that the dog was properly licensed and had been vaccinated. He said the dog was destroyed. 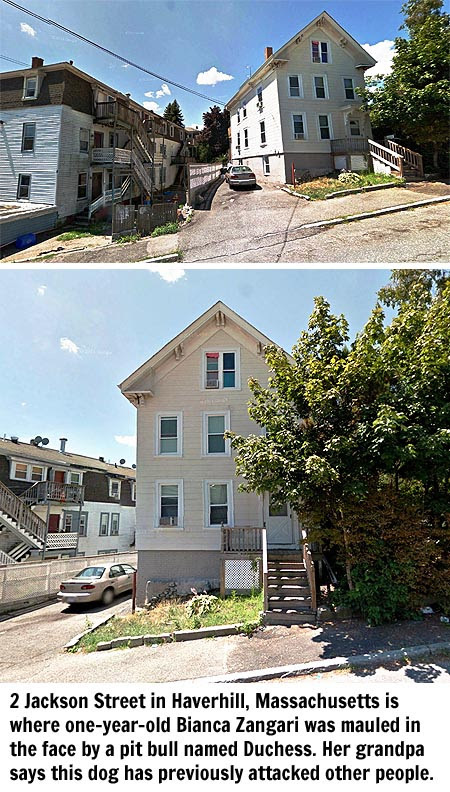 Police had previously identified the dog's owner as Elizabeth Kakides of 2 Jackson St.
Samantha Dacey said destroying the dog brings her little satisfaction. She wants something more to be done. "Dogs are what we make of them and the dog being put to sleep doesn't offer justice to my niece, who will be scarred the rest of her life," said Dacey. "She's my brother's daughter, and my only niece." 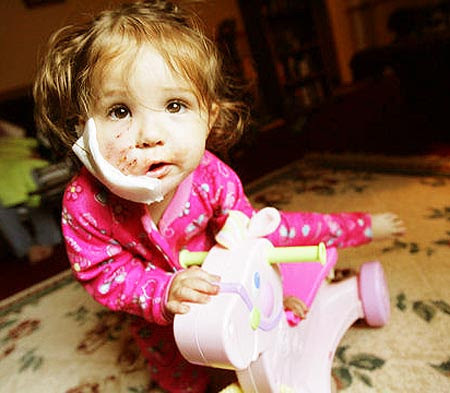 Last week, Bianca's grandfather, Tim Dacey of Haverhill, said the girl and her mother, Katelyn Zangari of Haverhill, were visiting friends last Wednesday afternoon at 2 Jackson St., the home of the adult pit bull, when it bit her face. The girl required extensive surgery and more than 50 stitches because of the bite, family members said. She was released from the hospital last Thursday morning. Her mother said doctors told her they will have to wait until Bianca heals to determine whether she will need other treatment, such as plastic surgery to improve the appearance of the scars. Following the attack, police removed the dog and Kakides signed papers with the city's animal control officer giving permission for the dog to be destroyed. She said the MSPCA told her the dog would be humanely put down and that although it broke her heart, she said "it had to be done." The little girl's grandfather says this pit bull has attacked several other people prior to the attack on his granddaughter. Katelyn Zangari said her daughter had played near the dog named Duchess several times in the past, never with a problem. She said another person who was in the room with them at the time apparently stepped on the pit bull's tail. The dog then turned in the direction of Bianca and bit her face, Zangari said. Kakides said the dog was actually owned by her former husband, who recently had gone to jail, and that she was caring for the dog. Zangari said last week that she did not want to cause problems for Kakides and that she did not hold her responsible for the attack. Samantha Dacey said she would have acted differently if her daughter had been the victim of the bite. "If a dog ever bit my children, I would want to pursue the owner regardless if they were friends or not," she said. UNITED KINGDOM -- A MUM is undergoing surgery today after a dog tore into her leg as she fought to stop it attacking her three-year-old son. Primary school teacher Lisa Hurndall was walking along Marske beach with her son Jamie, her mum and two dogs when the incident occurred in front of shocked onlookers. Jamie had been playing in a pool of water left by the tide when a white Boxer dog pulled him face down into the water. Lisa, a 30-year-old single mum from Brotton, raced to save her son from the dog which had hold of his shorts. The dog retaliated by biting up and down her left leg leaving her with a deep 8cm long wound and muscle damage. Lisa was taken to the James Cook University Hospital, following the incident at about 3pm on Sunday. She has already had one operation but has lost the feeling in her foot, is having skin grafts today and will need physiotherapy. Lisa, who teaches three to five-year-olds at Galley Hill Primary School in Guisborough, is worried the injury may affect her career and is also concerned for her son. She said: “My mum lives on the Headland in Marske and we were walking my two Rottweilers and my son. My dogs are the softest dogs - we were at the cliff house where the boats are. “There was a pool of water and I threw the dogs’ ball into it. They didn’t go for it but my son picked it up and shouted for my dog China. “There were five lads, aged 25 to 30, walking along, wearing Bermuda shorts with their T-shirts tucked in the back so their top halves were naked and there was a white Boxer with long legs - the lads had no control of it, it was bouncing all over the place. “My little boy was holding the ball shouting my dog’s name when the Boxer jumped up on him. He got frightened and it knocked him face down into in the pool. It started pulling on the back of his shorts. Lisa tried to get the dog off her by putting her hand into it’s mouth but it didn’t work. “It kept digging it’s teeth in and annihilated my leg - it was scary. “My mum ran across and tried to poke the dog’s eyes. “I lay down to give myself more strength. District nurse Joanne Martin from Guisborough, who was on the beach with her husband and daughters, looked after Jamie, who was hysterical, and they helped pull the dog off Lisa. Her five daughters helped find towels and blankets for Lisa. Lisa confronted the dog owner but when she asked for his details he refused to hand them over and walked off in the direction of Bydales School. Lisa was taken off the beach to an ambulance in a coastguard’s van. She will not be able to return to work for at least six weeks. “My career is on the line,” she said. Jamie and the dogs are being looked after by Lisa’s parents Malcolm and Iris. Lisa wants anyone with any information about the dog to come forward so that it will not attack anyone else in future. Redcar Police are investigating the incident and would like to talk to the owner of the dog or any witnesses. They are urged to contact PC Stenson on 01642 302 626. NEW MEXICO -- Fifty-four dogs were rescued Monday morning from what is being described by animal-welfare advocates as a house of horrors in Ribera, N.M. While most of the animals now in shelters in San Miguel and Santa Fe counties appear to be in good health, the living conditions in the mobile home were some of the worst imaginable, said Heather Ferguson of the Attorney General's Animal Cruelty Task Force, who called the home a "house of horrors." Most of the home was coated in an inches-thick blanket of feces and in one room, waste slopping from a wall reached as high as three feet. Bags of trash and other items filled the home, which contained little more than broken couches and litter-filled tables and chairs. Water from a bathtub tap had been left on over the weekend, flooding the home. The residence will likely be condemned, Ferguson said county authorities told her. There were signs that some of the dogs, mostly terrier-mixes, were eating dead dogs, said Ferguson and Bill Hutchison, communications manager with the Santa Fe Animal Shelter & Humane Society. Body parts of dogs were found throughout the house, and the bodies of at least 10 dogs were found scattered around the home. Lyle Roof, 67, the owner of the home, said he relinquished control of the animals Sunday evening from his hospital bed at Christus St. Vincent Regional Medical Center. Roof said he has kidney problems and was suffering renal failure when he was transferred to the Santa Fe hospital from Alta Vista Regional Hospital in Las Vegas, N.M. Roof said he tried his best to care for the animals but his medical condition took a turn for the worse about six weeks ago and he had no one to help him care for himself or the dogs. Most of the dogs, which he said he never counted, were offspring of two dogs he bought about a decade ago. He also cared for several dogs that were abandoned on his six-acre property, on the Interstate 25 frontage road near Santa Ana Road. His home is not far from last year's hoarding case in which 67 Afghan hounds were rescued. "I got sick and it just got out of control," Roof said in a telephone interview from the hospital. "I couldn't get out of there. I just hope all the dogs find homes. They're all good, sweet dogs." A neighbor, Rick Kingsbury, was one of the first to alert police about the case. Kingsbury said he came home late Saturday and found about 20 dogs on his porch and property. Kingsbury, who lives about a quarter-mile away across a mesa, said he suspected the dogs belonged to his neighbor, whom he didn't really know. Kingsbury said he's heard dogs barking from the property, and drove over to investigate. At the property, Kingsbury said he found a large group of dogs, the doors of the home open, the television on and water flowing from the bathroom. He called the state police, and eventually an officer came out, and the two walked through the home with a flashlight. "I thought there might be a dead body in there," Kingsbury said. "It was totally trashed." The state Attorney General's Office and San Miguel County Animal Control served a search warrant at the home early Monday, said State Police Lt. Eric Garcia. State police were at the site to provide security, he said. Teams from the shelter, the Santa Fe County Animal Services and San Miguel Animal Services were on the scene Monday to help rescue the animals. Four of the animals needed medical attention, but most were healthy. One frightened dog bit two of the shelter workers, and Hutchison broke his foot when he slipped trying to corral a loose dog. One worker needed stitches for the bite, while the other shelter worker's wound was dressed and bandaged. The dog will be quarantined for 10 days, but Hutchison said the dog appeared to be healthy. 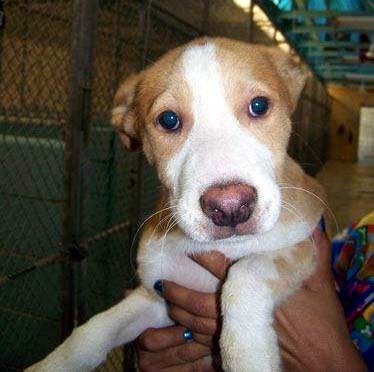 The San Miguel shelter took a dozen dogs, while others are being looked after in Santa Fe. A team of shelter workers using towels carefully pulled the dogs out of the vans and vehicles used in the rescue and placed them in holding kennels. Aside from the four dogs that needed immediate medical attention, the others are being provided with comfort and food. The shelter hopes to find people who could help foster the dogs until they're ready for adoption. In spite of the dogs' circumstances, they are remarkably social, Hutchinson said, and should make great pets. Roof said he always provided for his dogs and is supportive of the shelter. He tried to spay and neuter his animals, but the cost became too much of a burden. When his illness became too much late last week, Roof said he called a former girlfriend in Texas for help. She drove over and took him to the hospital. As for the squalor in which he lived, Roof said he imagines that people will make him out as a bad person. "If they ever get sick, then they'll know," Roof said Monday evening. "Partner, I always took care of those dogs. I had stacks of 50-pound bags of dog food for them." He also built sheds for the dogs on the property, he said. The mobile home will be torn down, Roof said, and he hopes to find new shelter with the help of friends and family. Kingsbury, the neighbor, said it was simply a difficult situation and he hopes people don't judge Roof too harshly. "It's just sad that we don't know our neighbors anymore," he said. Ferguson said it's important that people tip off authorities if they believe hoarding is taking place. Providing food for a person who keeps a large number of animals only enables that person, she said. Ferguson said she will encourage authorities to charge Roof with animal neglect charges as a way of making sure he won't get in the same situation again.